It was a relatively warm day in April in New York City while women were sweating and packed together on the second floor of Evolution Muay Thai. They were doing a round-robin of sparring, while the fighter hosting the event, Raquel Harris, oversaw that each woman was comfortable in-between rounds. Harris had been working towards an inter-city sparring session for female fighters over the last several months, and fighters from the corners of lower Manhattan to the realms of Brooklyn were present. One woman however, had travelled from much further out than the G or A train could’ve brought her, and was patiently waiting in a corner on the blue mats as Harris looked to match her up with another partner. 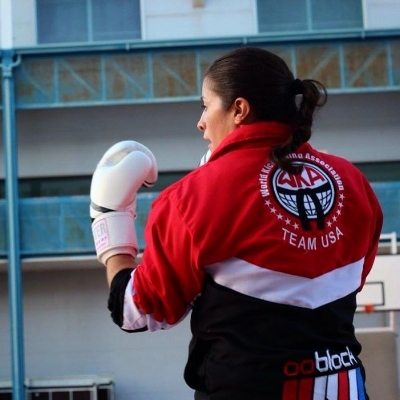 Erin Jimenez had came all the way from Maryland and was preparing for one of the biggest tournaments of her life, the IFMA international tournament that was to be held in Belarus. A student under Jason Farrell of Level Up Boxing, the fighter had more than twenty fights under her belt and had been training since 2010. As Harris made the introductions earlier in the afternoon about each fighter’s gym and record, when she spoke about Jimenez, Jimenez stood quietly and smiled shyly as her accolades were rattled off. 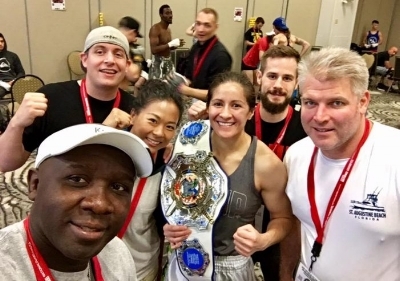 The grand scale of her accomplishments hit the room as Harris noted that Jimenez would be leaving with the U.S. Muaythai Federation team and would be competing in the equivalent of the Muay Thai Olympics. 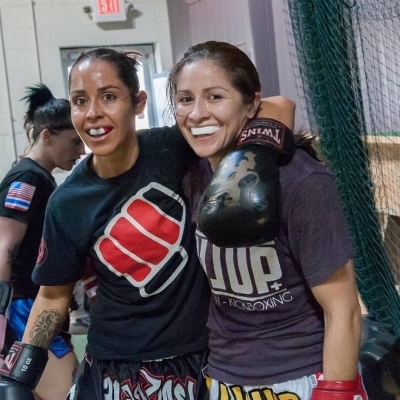 Jimenez nodded towards the other fighters in the room and then dived into training, remaining observant as she studied her sparring partners in preparation for all that would come in a few short weeks. In just another week, Jimenez will once again go with the USMF team and compete in the Pan-Ams in Mexico City, another IFMA-Muay Thai rules tournament. 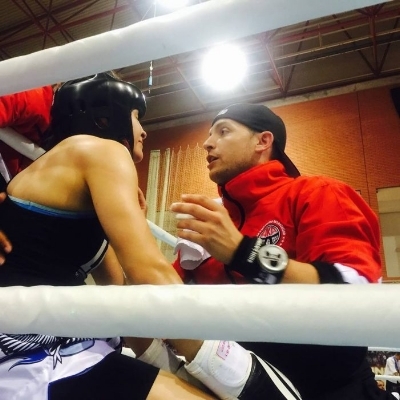 For all her victories, she never expected the success she has had as a Muay Thai fighter and coach. 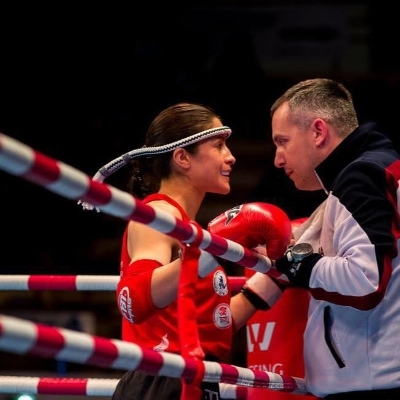 The 32-year-old competitor had a desire to fight since she was 15–boxing, that is–but was encouraged by her mother to focus on her education and go to school. Ever the ultimate student, Jimenez graduated with her PhD in Biology and works in a laboratory as a postdoctoral fellow. When she’s not in the gym training, she’s at work doing science experiments, using animals models to understand human diseases. Jimenez originally started training at MMA gyms but followed Coach Farrell when he created Level Up. Jimenez admired the attention and care that Farrell gives to his Muay Thai program and appreciated the culture that was developed in his gym. “There’s a sense of community here and a sincere respect, a feeling of family,” Jimenez says. “Jason goes out of his way to make us feel special and cared for.” Now Jimenez is a coach at their gym and has become one of the more experienced fighters, with a current record of 15-8. She looks to take the other female fighters under her wing and encourages them to be their best. However, she firmly states that she is the same as everyone else that walks through Level Up’s doors. As far as her crazy competitive year has gone, Jimenez is only looking forward to the next adventure. She went to IFMA one year earlier than she had originally intended, as she was selected by the USMF board members. They had watched her bout versus Kate Cottone earlier in the year at Warrior’s Cup, where Cottone came with a vicious elbow that dropped Jimenez into the ropes instantly–only for Jimenez to jump back up and continue the fight. The USMF admired her heart and fighting spirit, and offered her the spot on the U.S. team. Cottone and Jimenez reunited in Belarus, this time as teammates and friends. 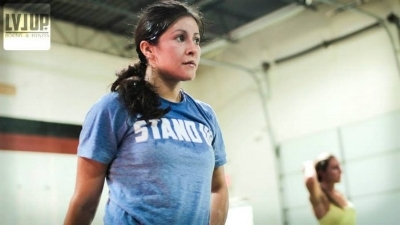 Jimenez trained for IFMA the way she does for any fight, as if they were the World Championships. A difficult factor of the tournament was the fact that the fighters needed to weigh-in every single day, not giving them much time to recuperate after their last fight, as they’d have to go through cutting weight all over again for the next day. However, Jimenez felt as though she thrived, despite the circumstances and the pressure of representing the United States. Now she is looking to do the same in Mexico City.